It’s just around the corner—implementation of perhaps the biggest shift in food safety regulation. 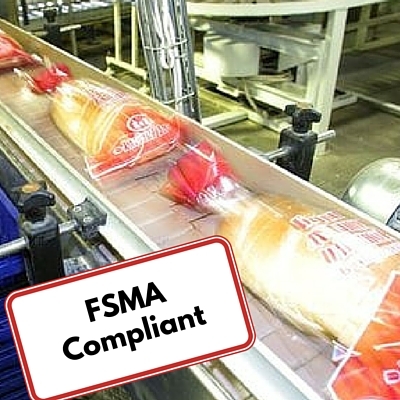 The FDA’s switch from a reactive to proactive stance is outlined in the Food Safety Modernization Act (FSMA), which will soon hold bakeries to compliance. While this means a flood of paperwork and hazard analysis, there are tools available to make the shift easier. The implementation of FSMA has been a long-time coming. It was passed in Jan. 2011, and laws for grain based foods were finalized in late 2015. The FDA hopes swinging the food safety pendulum will eliminate outbreaks before they start. The first wave of bakeries has until September 17, 2016 to be in compliance with the law, starting with operations that have over 500 employees. Bakeries with under 500 employees have until September 2017. However if a bakery has under $1 million in sales per year, the deadline will be September 2018. Take a quick peek at the deadlines here. To find out what steps bakeries should be taking for FSMA, I spoke with Barry Parsons, an expert in food safety and retail operation. He said retail locations and storing warehouses will see little change in operations due to FSMA. But manufacturing sites? With deadlines just a few months away, bakeries should be focusing on their hazard analysis plan. Formerly, food manufacturers could outline Hazard Analysis Critical Control Points (HACCP). However, HACCP now only applies to seafood and juice, while all other food must implement the much more rigorous Hazard Analysis and Risk-Based Preventive Controls (HARPC), Parsons explained. Sites must have their HARPC in place by the FSMA deadline. So manufacturers will need to do a hazard analysis, look at pre-requisite programs (PRPs) and identify critical control points. This means a lot of man-hours, analysis and paperwork. “If a company already has HACCP in place, then they are in pretty decent shape. If they don’t, they have a lot of costs coming up,” Parsons said. In the long term, FSMA will mean a much more in-depth record keeping process, Parsons explained to me. Manufacturers will need to do intense tracking, verifying and validating to produce data on for the FDA. Focus for Bakeries: The Kill Step! When it comes to potential critical control points, bakeries may not have many high risks as some industries. Still, there are crucial ones to identify and track. Perhaps the most widespread control point for bakeries is documenting the kill step for mold and bacteria growth. To help bakeries with this, AIB microbiologists worked closely with the FDA to scientifically correlate the bake cycle required to achieve rigorous Salmonella destruction in baked good varieties. Next, the AIB created and published a tool that helps bakers through the steps of measurement. By using these free calculators, bakeries can create the exact data needed for FSMA compliance. A key part of the calculations involves using the Super M.O.L.E.® Gold 2 thermal profiler by Electronic Controls Design (ECD). Ray Pearce, product manager for ECD, told me the calculator and profiler will be a great asset to bakeries. And a cool byproduct of using a thermal profiler? Profiling baked goods can help with shelf life, consistency, and crumb, while lowering energy costs. “You’re going to gain yield improvement, while gaining compliance for FSMA,” Pearce said. Use the AIB Kill Step Calculator for free HERE! Once there, pick from one of the four varieties of products, download the calculator with Excel Workbooks, and then use AIB tutorials and instructions to help with gathering and inputting the data. Order a profiler HERE.